1. Morris, C. B. & Carpenter, S. (2014). On being invisible and passing through walls: Toward a pedagogy of seeing and being seen. In (S. Goncalves & M.A. Carpenter, Eds.) Diversity, Intercultural Encounters, and Education. NY: Routledge. This autobiographic and autoethnographic study is presented by two educators and scholars that tell their stories as “invisible others.” Their intended audience is fellow educators and scholars. While aware that autoethnography has been questioned as a research methodology because of its tendency to be narcissistic and self-indulgent (Holt, 2003), their research is supported by autobiographical theory, critical race theory, and critical pedagogy. the goal for their study is to describe and deconstruct their own specific, personal examples of invisibility, so that we as the reader might move toward a reconfiguration of how these subjectivities survey and are themselves surveyed (Berger & Luckmann, 1966) as both invisible and passing bodies. They encourage readers to go beyond the self of the authors and to engage with their own identities and power as they seek means by which to impact the curricula and methodologies available in various educational environments. When they were writing their stories that were shared they asked, why are we telling these stories? They agreed that stories not only convey information but they also have the power to instigate change. The telling and sharing of stories help overcome ethnocentrism and viewing the world in only one lens. The study serves the interests of those who identify as “invisible others” but then also those individuals who do not. The sharing of stories promote the thought process of all individuals to question their own cultural identities and how that affects their life, thoughts and actions. “Various aspects of personal and cultural identities are in transition and are dynamic. Recognizing our own individual sociocultural identities and biases makes it easier to understand the multifaceted cultural identities of others. It may also help us to understand why and how individuals respond as they do (Ballengee-Morris & Stuhr, 2000).” They state, “Educators who guide their students to make meaning out of this complex and ambiguous world of personal and external identity construction help them to make sense of their own places and spaces. Learning how to make connections and not see subjects or people in isolated, unrelated ways is a lifelong skill that is vitally important for students to learn.” And conclude with “a curriculum of personal and external identity construction, with the goal of social responsibility, helps students to view images in a thoughtful manner so they develop democratic ways of thinking and becoming informed consumers.” As an art educator I wish to accomplish this in my classroom. The world is a large and frightening place and if I can make my art room a safe place where we can talk about these issues and discuss how the students feel then they know they don’t have to struggle alone. They have a class full of others trying to learn and express themselves along with them. The art room is also where the discussion of the effects of damaging visual stereotypes can take place. If art educators can try this in each of their classes there is the potential to have a large population of the next generation to be socially aware and make a positive change. 2. Cliatt-Wayman, Linda. Linda Cliatt-Wayman: How to fix a broken school? Lead fearlessly, love hard | TED Talk | TED.com. N.p., May 2015. Web. 28 June 2017.
share the same thoughts with my own students. 3. Rodriguez, Giovanni. “Why Arts Education Matters In The Age of Tech and Diversity.” Forbes. Forbes Magazine, 09 June 2015. Web. 28 June 2017. Elementary teachers present their unique ideas for how to connect Impressionism, a still-life painting, and poetry to their classroom curricula. This video was excerpted from the 2012 Culminating Event of the Getty Museum’s Art & Language Arts program. These teachers spent a year long training of professional development and share what they learned. I LOVED the game the teachers introduced from the still life. I will be including that in my curriculum this year and trying them with my class. I noticed that their ideas and training followed along with Bloom’s taxonomy and I was able to recognize the connection from the last few modules previously. Eunjung Chang, professor from Francis Marion University, writes about the process of looking at art with young children. Art Trek is the name of the program being spotlighted in this paper. The Art Trek is a leaning program for families with children between the ages of 5 and 12 at Metropolitan Museum ofArt (Met). It interactively exposes children to different artworks across cultures and styles in multiple artistic experiences, by questioning, listening, discussing, playing and drawing in a group setting. With access to museums at an early age, children can experience impressive images, explore cultures and develop skills ta interpret visual language. Early childhood educators often limit art experiences for young children to include only artmaking with little or no time devoted to looking at or talking about art (Shaffer and Danko-McGhee 2004). Art criticism allows children to question, acquire new vocabulary, increase perpetual awareness, and strengthen their descriptive power. Throughout Art Trek, children are introduced to artworks housed at the Met and are encouraged to engage in art-related experiences. Children are art explorers, and by doing this children learn to be listeners and have options and preferences. Also, the paper states what we, as art educators, always knew, that children are artists. During the summer I work at a day camp for children ages 2-16 from New York City, Westchester, Rockland and New Jersey. I teach art for the “upper” camp which consists of ages 8 through 16. My classroom environment during the summer is so different from the school year. It is a change of pace, ages, materials, classroom management and expectations. 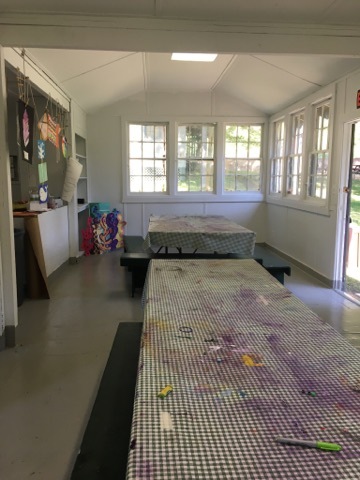 The environment for my summer art cabin is fast paced, filled with high expectations and and organized chaos. 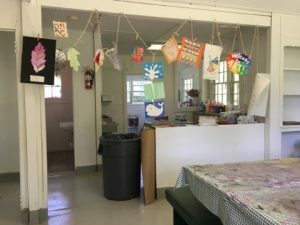 The camp requires each child to go home with a finished art project every Friday. My students come to art twice a week for about 25 minutes each class. The project expectations set by the camp are disproportionately set for the amount of time and materials I have for my students. Because of this my classroom management during the summer has to be airtight. Early in the summer students get reminded of classroom layout, materials, expectations, behavior and overview. Each lesson is planned and students always know that projects go home on fridays. We have some of the quickest “10 second tidies” because we work until the last minute to get the most out of the time. My students come from all different areas of New York City, Westchester County, Rockland County, and New Jersey. My students are ages 8-16. They come in classes of 26. They are divided into “Inter girls 1 (ages 8/9)” “Inter girls 2&3 (ages 10/11)” “Senior girls 1(age 12)” Senior girls 2 (age 13)” and “teens ages 14-16)”. The students call me “Melissa” rather than “Ms. Akey” in this setting and they know I am an art teacher during the school year as well. Most of my students are female. The teens are my only class with both boys and girls. 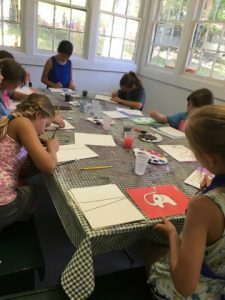 Some of my positives to the summer art classes are that all the students sign up to come to art classes so they all want to be there. Because of this they are willing to work hard and prepare to have their projects ready for Friday. For me, the entire art program layout needs to be reevaluated. It kills me that my students are pressured to produce a project by such a short time frame. My philosophy is that the process of artmaking is more important than the product. The owners of the camp believe that the product is the most important and thats the only measure of what is happening in the art room. You (all of you reading this blog) and I both know that is ridiculous. I wish my students had the ability to continuously work on projects and techniques that they enjoy and get to enjoy their summer. I wish it was more relaxed and they spent the summer working on skills they want to improve or explore. My students are so good though. They are curious, hardworking and so so creative. Once I give them the main idea of the project I let them make as many of their own artistic decisions as possible and they are always so well done and thought out. The daily routine of camp follows an 8 period daily schedule. The camp day takes place from 9:30-3:30pm. Students have 7 different periods of art, music, swimming, sports, drama, nature and outdoor adventure and a lunch period. I typically teach 4 studio classes, 2 knitting classes and a period of set design for the camp musical a day along with a lunch period. The difference in my summer and school year environments are always a challenge and makes me appreciate the pros to each environment and the challenges I face with the cons are always brushing up my skills and ability to think on my feet. I knew I wanted to become an art educator before I had any knowledge of theorists, issues, and theories in art education. I knew I wanted to be an art educator when I was a high school student falling in love with color, line and my sketchbook. My education grew as well as my love of mediums, art history and the work of Mark Rothko, Sam Francis and Gustav Klimt. I grew to appreciate the work of artists and cultures and to recognize their impact on the contemporary. The work of Mark Rothko and Sam Francis will always hold a special part of my art education because their work taught me how a piece of work can cause a reaction in the viewer and that can be a positive or negative. That great work makes you think, appreciate, and question. In an art history class I was introduced to Rothko’s Blue and Grey, painting created in 1962 and it made me so furious to accept yet it was so peaceful to view. That is when I learned how powerful art can be. I wanted to be an art teacher to facilitate the same exploration and admiration into the arts for my students. My philosophy of art education is constantly in flux but the basic principals remain the same. My art room is a place of self-expression and learning. In my art room patience is abundant and art making is plentiful. My students will learn to value themselves along with the artwork they create. My students will also explore the history of art and its impact on the contemporary. The artists that develop in my class will leave with an appreciation of the arts and the skills to incorporate them in their everyday lives. I believe in the sketchbook. I believe the sketchbook is an integral part of my student’s life as an artist. It is in their sketchbook that my students can explore the elements and principles of art along with mediums and artists. It is a safe place to escape when life or other subjects are feeling overwhelming. They can open the blank pages and get lost in their exploration of the arts. The sketchbook is continuously used in lessons and in assessment during the class and my students have a place to look back and see all the progress they have made throughout their journey. Art Education is a difficult subject to define. In a literal sense art education refers to the learning, instruction and programming based upon the visual and tangible arts. Art education includes performing arts like dance, music, theater, and visual arts like drawing, painting, sculpture, and design works. Its definition is constantly changing along with the world we live in. Different media and processes in which art can be made in the classroom can broaden the curriculum taught by art educators. My definition of art education encompasses so much more. Art education is where fine motor skills are developed and creativity and problem solving strategies are practiced. Art encourages observational skills, communication and cause and effect. Issues in art education are always evolving along with the definition of art itself. One issue in art education that is both personally and professionally significant is the lack of funding for the arts. My career is in jeopardy more often than other subjects in the educational field. The student’s art programs are in jeopardy more often than their other subjects they have in school. There are very important skills and lessons taught in the arts that aren’t prioritized during large budget decisions. 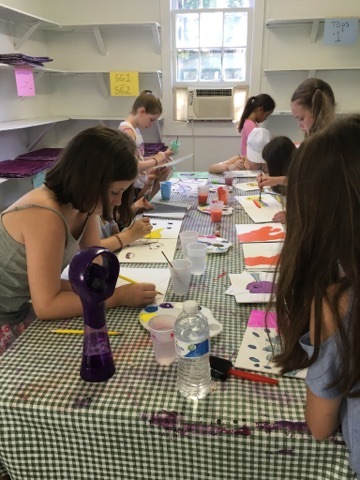 Art education is so important because it is here in the art room that students can tackle issues facing themselves and the world today in another creative outlet. If a student can’t find the words to express him/herself in art maybe they can by a variety of mediums and processes. It is in my art room that together, my students and I, we can discuss and explore difficult content, issues facing society , and even issues within visual culture. Art education gives students a chance to express themselves differently than they can in their other classroom settings. A personal issue in art education that I would also say is a challenge for myself is the requirement of using formal assessment in the art room. Introducing the use of exit tickets and having students tested on their knowledge through more formal approaches rather than in-class critiques and rubrics have been a learning process. One of my strengths in art education would be lesson planning. During undergrad I had an extensive and in depth education in lesson planning. Then I got into the classroom and learned quite quickly that its great to have it on paper but you cannot account for everything and in art, such as life, it gets messy. I learned to think on my feet and to allow for variation and modification without reconstructing the entire lesson. In art, one’s education is never complete and I look forward to gaining more knowledge on how to incorporate more art education theories realistically in my classroom. I also want to learn more about formal assessment in the art room and how it can drive my future lessons using feedback from my students. I hope to achieve these learning objectives by research, and learning more from my instructors as well as my fellow students. That is what I am looking forward to the most. Being a part of a community of art educators that can bounce ideas off each other as well as give advice from past experiences and knowledge. As a young teacher that is so valuable and I plan on taking in all this course and fellow art educators have to offer.